One of the most popular ways to use the web is to simply search for images. People love to search for images online, and there are many sites and search engines dedicated just to chasing down all sorts of images. We use them as part of a project, to decorate our websites, blogs, or social networking profiles, and for so much more. Here is a collection of just a few of the best sites for finding images online. Google Image Search: Google's huge database will help you find pretty much any image on any topic that you can think of. It's easy to use, and indexes literally millions of images. Filters are also available here to narrow your search by size, color, resolution, and much more. You can also use Google to search for an image by actually using that image in your search query; this is what is called a reverse image search. Picsearch: Find images, photos, animations; the "Most Popular Pictures" feature is especially useful. 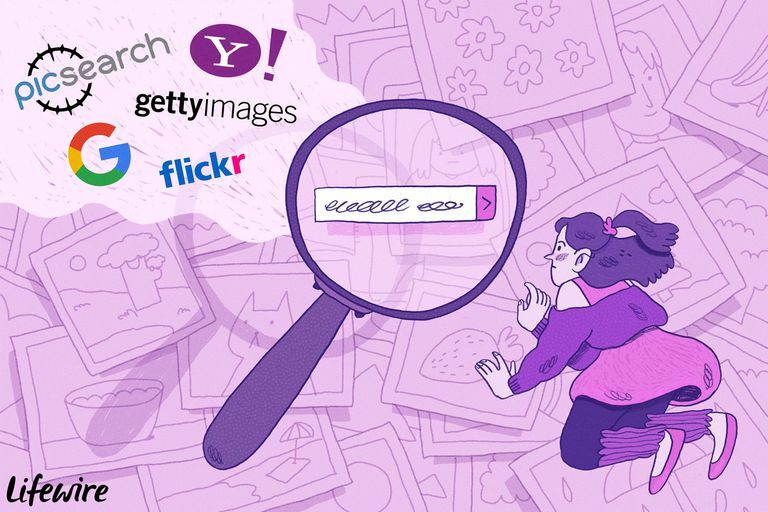 Yahoo Image Search: Use Yahoo's Advanced Image Search to really narrow down your searches. You can filter by size, coloration, site/domain, and more. Flickr is a great place to go to find a huge array of different photos. Make sure you check if the photo you want to use is available to use on other sites, as not all Flickr users give this kind of permission. If you're just looking for fantastic photo galleries from talented photographers worldwide, Flickr can also be a useful source to utilize. Fabfotos.com: High-quality photography collection; includes only sites with high-quality submissions. Getty Images: Huge database of searchable images from various leading brands. You can narrow your search to include only royalty-free images. This site offers different levels of image access. Hubble's Greatest Hits: Amazing pictures of space objects as collected by the Hubble telescope from 1990-1995. University of Colorado Garst Photographic Collection: Amazing collection of over 20,000 images put together by the Garsts as they were filming for Mutual of Omaha's Wild Kingdom television series. American Memory Collections: Photos and Prints: From the Library of Congress. Collections include Ansel Adams photography, Civil War, and Presidents and First Ladies. The Smithsonian Institution Archive Collections: Search or browse through selected images from Smithsonian collections. Classroom Clipart: A source for free downloadable clipart, searchable by topic. Eastman Museum: Search through a wide variety of photo and image collections, including motion picture and technology collections. The LIFE Picture Collection: Powered by Getty Images. A fascinating collection of photos and images included in both Time and Life magazines. National Geographic Photography Collection: Includes photo galleries from this acclaimed magazine, gorgeous wallpapers, a photo of the day, and more. NASA Image and Video Library: Search among thousands of NASA press release photos, videos and audio recording spanning American manned space programs from the Mercury program to the STS-79 Shuttle mission. NYPL Digital Gallery: The New York Public Library's collection of free digital images. NYPL Digital Gallery provides access to over 337,000 images digitized from primary sources and printed rarities in the collections of The New York Public Library, including illuminated manuscripts, historical maps, vintage posters, rare prints and photographs, illustrated books, printed ephemera, and more. Public Domain Images: For images that are free to use without copyright issues, check out this list of public domain image sources. Users are free to use these within most commercial and private projects. Ever wonder where an image you see on the Web actually came from, how it is being used, if modified versions of the image exist, or to find higher resolution versions? Google offers a very easy way to do a quick reverse image search. For example, you can use a general Google search query, locate an image, then simply drag and drop that image to the search bar to indicate you'd like to search using that actual image to find out where other instances of it might be on the web. If you have the direct URL of where the image resides, you can also search using that as a start. Upload an image from your computer, or copy and paste an URL that has the image you're investigating. TinEye comes back with a list of possible sources for that image.